Let us help you find relief with Japanese Acupuncture! At Perth Physiotherapy our practitioner uses the Japanese method of acupuncture. 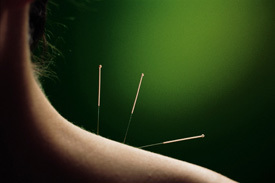 Japanese Acupuncture is different to traditional acupuncture in a few different ways. Our practitioner Kento Kudo uses thinner and finer needles than traditional Chinese acupuncture which requires less needle manipulation into the skin. This results in a pleasantly gentle way of alleviating pain and bringing stress relief. Our practitioner focuses on releasing trigger points in the body, which addresses tender spots in the body and brings about pain relief and relaxation. Japanese Acupuncture is thus very effective for individuals experiencing sports injury, muscular-skeletal problems and chronic pain.